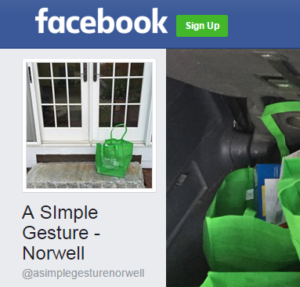 The idea of A Simple Gesture Norwell grew out a Wall Street Journal article highlighting the work of a community in California that had solved the simple problem of getting food that people wanted to donate from their own pantries to the Food Pantry. The idea of providing a bag, replacing full bags with empty bags, spread to Greensboro North Carolina and other communities where the same concept was replicated. In order to set up this program in our community, we contacted the California and North Carolina organizations. These pioneers were extraordinarily generous at helping us get off the ground. We would like to share our experiences to those interested, as well. Before we begin, we want to be clear that we wish to share anything and everything, including our web design, pictures, logo, and this guide. That said, for SEO purposes, google and other search engines will penalize both of us if you copy and paste the language directly from these web pages. Thus, write your own web based content to speak to your own community’s needs. Other than that, everythin g we have is yours to use and share. It took our team roughly 9 months from research to our first pickup, so remember to allow for time. Step one: Contact your local food pantry to establish if there is need in your community. A logistics person, or a manager, who can organize drivers, sorters and other volunteers. Seed money, $1k – 2k, for the first order of bags, compliance costs, and other non-donated wares. Invite your local Food Pantry administrator to your initial meeting (at least) to understand what their needs are, how you can help them keep a steady supply of food, and to learn who else might help with the effort. Check out this calculator to see what your expected yield would be in your community. Your pickup dates format; we found the second Saturday of every other month worked with our Food Pantry. You’ll need these dates for all your initial marketing material. Budget (your biggest initial expense will be bags). A bag provider: Use nylon or poly pro bags that can handle at least 40 lbs. Sturdy will let you recycle bags over and over, so quality pays off in the long run. We picked bright green since it stands out and “cool green bag” works. Identify local attorneys who can draft your by-laws and articles of incorporation, pro bono, if possible. Assign a lead tech person to create a google account where your executive team can share documents, pictures, emails and your primary donor database. We use Google sheets (worksheets, like MS Excel) as our database manager, with columns for name, address, email contact, volunteer preference (donate food, drive, sort) and a phone as minimum required fields. “Notes” and “bag delivered” columns are useful too. Phones are important since volunteer drivers must call all the houses they’re visiting a couple days before pickup: these personal phone reminders improve your results by a margin too large to ignore. Meet to review design ideas and make decisions on promotional material. (Our logo designer would be flattered if you use our logo, or get your own, but now is the time to make that decision.) The bag makers will need a black and white version, if your logo on the bag is single color like ours. Reserve your web site name, select a hosting organization and register your new site. We used GoDaddy, but would not use them again unless you are familiar with their processes and like them. We use WordPress as the web editor: it is inexpensive and common enough that many web and marketing professionals whom you may engage with will be familiar. Create web forms for collecting volunteers and donor data. Create a Facebook account for the organization, using the same name (e.g. : https://www.facebook.com/asimplegesturenorwell/). That process is easy and well documented on-line so we won’t describe it here. If Facebook has a Town Social group in your town, it might be your most powerful promotional punch for the crowd that uses Facebook. Link your website to it as soon as you have your forms up to begin accepting names. to allow you to get your 501(c)(3) registered with the IRS. You’ll need that for a taxpayer ID (EIN) to open a bank account. You will then have to complete a 1023EZ. This will charge $400 as the IRS registration fee. Remember, with the IRS 501(c)(3) status, you can accept donations to defray your costs, and people can get a tax deduction. Naturally, consult local legal, tax, and accounting professionals for the proper order and process for this documentation and compliance. Organizational documents, IRS registration, bank account. Decisions on bags vendor, printed marketing material provider, and logo. Identify your best contacts within your community, including any faith based organizations, Boy and Girl Scouts, schools, Chamber of Commerce… basically brain storm who can help get the word out. Set up an email marketing vendor (we use Constant Contact – inexpensive for 501(c)(3)’s) if your web hosting package does not include email marketing). Hit Facebook and especially your town’s Social page. Boost the Facebook posts. Thank everybody who volunteers. Send news releases to local and regional papers. For an idea, our press release appears here. a printed brochure to share with neighbors. Begin to organize driver routes. Figure a driver for each 10 donors, to keep the driving process manageable. Our logistics person created separate lists for each driver, showing address, phone, and notes on unique home landmarks. Drivers are best suited working in their own neighborhoods,. One of the ancillary benefits of the program has been the re-connection of neighbors doing Good Work. Keep promoting on Facebook, update on-line pages as needed. Thank all volunteers. Send your first blast email reminding people of the date and the seasonally demanded Food Pantry items. Request volunteers, drivers, and sorters. Assign Drivers their routes. Remind them to call 2 – 3 days before pickup, and ask about anything unusual about the bag location (suggest the door nearest the driveway). Saturday pickups are best if done consistently, 9 AM – 10 AM. This gets you the bags to the Food Pantry within a one hour window, respecting the volunteers’ (and leaders’) time. Close out new sign-ups with a nice message saying driver routes have been assigned, but that the drop-off will be at (location). Establish a cut-off date for new sign-ups. Any sign-ups after that date will be assigned a driver for the next pickup. Bring a scale to weigh and record each bag. Use this information for future marketing. Our bags averaged 15 pounds consistently so we stopped weighing after a few pickups and just counted bags, extrapolating weight. Sorters should expect to check expiration dates as you local Food Pantry does not want expired food. These are the basics, but you will find your own methods to make this an effective program for your community. Good luck, have fun, and enjoy the experience.